I am currently a football player and teacher through the SALT Academy. My parent are farmers and have three children, so when I was young, I had to work on the farm instead of having the opportunity to attend school. After I got involved in SALT, I have had the opportunity to attend school, learn a sport, and become a good coach and leader. I have been involved in SALT’s leadership training as well as teach gender equality classes at various football festivals we organize. 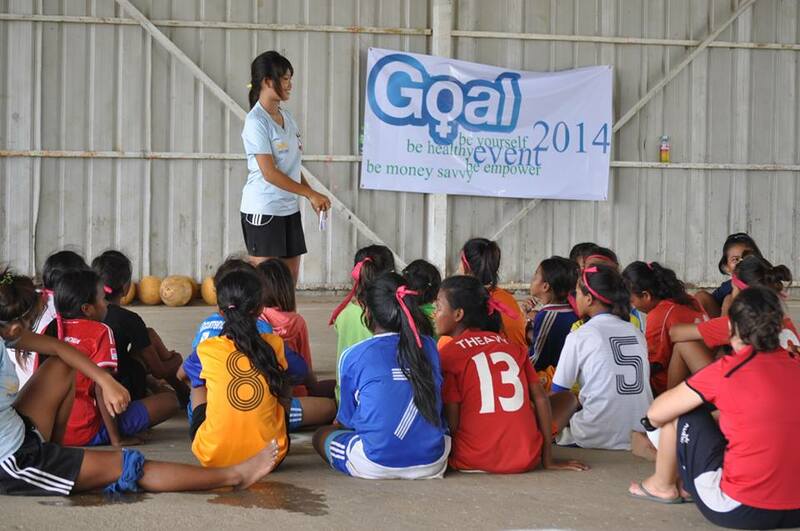 We are also able to visit different communities to teach children soccer skills and host educational workshops. I also coach girls’ and boys’ soccer teams, especially concentrating on being a good role model for the girls in my community. I want to teach them that they are equally capable to play football and also complete their education. I hope to become a better leader through the Asian Girl Campaign and share what I learn with my team, players, family, and community. Through this, my goal is to become an even better role model for the girls I coach, as well as girls throughout Cambodia and the rest of the world. It is important that girls know they are equally capable of playing football, being leaders, and receiving an education. In the past, I have been told that girls cannot play football, but this is obviously not true. I have coached and played this sport and feel that girls have been empowered through their experiences at SALT Academy. My supportive family has allowed me to do things I would have never been able to do before, but many girls in Cambodia must marry early without the choice of playing football or studying. This overall attitude of women is one that must be adjusted.